Thoroughly prep the natural nail. 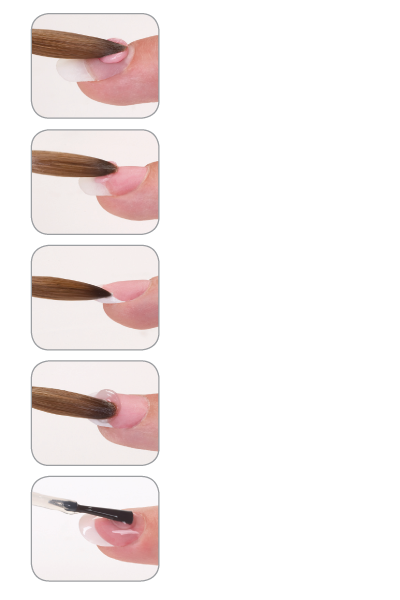 Using a Nail Wipe saturated in Nailpure Plus wipe the nail. 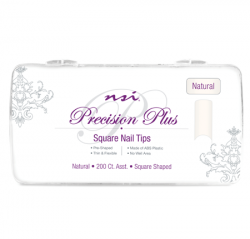 Apply a Precision Plus Nail Tip. Cut, file and blend the tip. Apply Essential Bond liberally to the nail. Using Purely Pink Masque Powder, start in Zone 3 using a medium-wet mix ratio. Place a bead near, but not touching, the cuticle. Press from side to side to get even coverage. Pull and brush the bead like a polish into Zone 2 until it has been thinned and has a grainy appearance. Continue using a medium-wet mix. Place another bead of Purely Pink Masque Powder on the area of Zone 2 that was thinned down and press the bead from side to side to get coverage. Pull and brush the bead into Zone 1 until it has been thinned and has a grainy appearance. Using Radiant White Powder, continue working with a medium-wet mix ratio. Place the bead in the middle of Zone 1 creating your smile line away from the natural free edge line. Using the tip of your brush, lightly press from side to side to evenly distribute the product. By using gentle pressing, pushing, and guiding techniques, you can create deeper corners. Smooth down over the entire extension edge. Overlay the entire enhancement with a thin layer of Totally Clear Powder, using a medium- wet mix ratio. 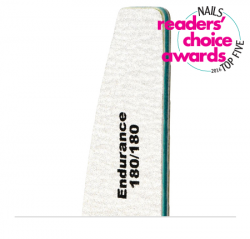 File and shape with an Endurance 180/180 Grit File. Remove excess dust with Plush Brush. Clean the nail using a Nail Wipe saturated with Cleanse, to remove any dust that may be hiding in the side walls. 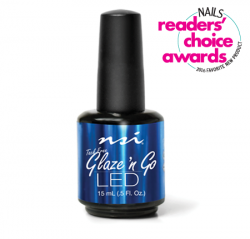 Apply Glaze ‘n Go LED in polish style strokes and cure in the Dual Cure Lamp, LED, for 30 seconds or UV for 2 minutes. Apply Nurture Oil to the cuticle and massage in to complete the service.